This article is about the letter combination. For other uses, see DL. Not to be confused with ǁ. In English, ll often represents the same sound as single l: /l/. The doubling is used to indicate that the preceding vowel is (historically) short, or that the "l" sound is to be extended longer than a single "l" would provide (etymologically, in latinisms coming from a gemination). It is worth noting that different English language traditions transpose "l" and "ll": British English "travelled" and like words, for example, are usually spelled with a single "l" (i.e., "traveled," et al.) in U.S. English. In Welsh, ll stands for a voiceless alveolar lateral fricative sound. The IPA signifies this sound as [ɬ]. This sound is very common in place names in Wales because it occurs in the word Llan, for example, Llanelli, where the ll appears twice, or Llanfairpwllgwyngyll, where the ll appears three times. In Welsh, 'Ll' is a separate letter from L (e.g. lwc sorts before llaw). This led to its ligature being included in the Latin Extended Additional Unicode block. The capital ligature appears similar to a joined "IL" and the minuscule ligature like "ll" joined across the top.. This ligatured character is not used in Modern Welsh. In Spanish, ll was considered a digraph from 1754 to 2010 as the fourteenth letter of the Spanish alphabet because of its representation of a palatal lateral articulation consonant phoneme (as defined by the Royal Academy of the Spanish Language). This single letter was called "elle". This letter was collated after L as a separate entry, from 1803 until April 1994, after a vote in the X Congress of the Association of Spanish Language Academies ruled for the adoption of the standard Latin alphabet collation rules. Since then, the digraph ll is now considered a sequence of two characters. A similar situation occurred with the Spanish-language digraph ch. Hypercorrection leads some to wrongly capitalize it as a single letter, as with the Dutch IJ (*"LLosa" instead of the official "Llosa"; "LLOSA" is the right form in full uppercase). In handwriting, it is written as a ligature of two Ls, with a distinct uppercase and lowercase form. An old ligature for Ll is known as the "broken L", which takes the form of a lowercase l with the top half shifted to the left, connected to the lower half with a thin horizontal stroke. This ligature is encoded in Unicode at U+A746 (uppercase) and U+A747 (lowercase) and displayed (by the browsers that allow it) Ꝇ and ꝇ respectively. Today, most Spanish speakers outside of Spain pronounce ll as virtually the same sound as y, a phenomenon called yeísmo. As a result, in most Spanish-speaking parts of the Americas as well as in many regions of Spain, Spanish speakers pronounce it /ʝ/ (voiced palatal fricative), while some other Spanish speakers in the Americas (especially Colombian and Rioplatense speakers, and in Tabasco, Mexico) pronounce it /ʒ/ (voiced postalveolar fricative) or /ʃ/ (voiceless postalveolar fricative). In official Galician spelling the ll combination stands for the phoneme /ʎ/ (palatal lateral approximant, a palatal counterpart of /l/). In Catalan, ll represents the phoneme /ʎ/. For example, as in llengua "language" or "tongue", enllaç "linkage", "connection" or coltell "knife". In order to not confuse ll /ʎ/ with a geminated l /ll/, the ligature ŀl is used with the second meaning. For example, exceŀlent is the Catalan word for "excellent", from Latin excellente. 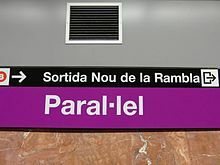 In Catalan, l·l must occupy two spaces, so the interpunct is placed in the narrow space between the two L: ĿL and ŀl. However, it is more common to write L·L and l·l, occupying three spaces; this practice is not correct although it is tolerated. L.L and l.l are incorrect and not accepted. See interpunct for more information. While Philippine languages like Tagalog and Ilokano write ly or li in the spelling of Spanish loanwords, ll still survives in proper nouns. However, the pronunciation of ll is simply [lj] rather than [ʎ]. Hence the surnames Llamzon, Llamas, Padilla and Villanueva are respectively pronounced [ljɐmˈzon]/[ljɐmˈson], [ˈljɐmas], [pɐˈdɪːlja] and [ˌbɪːljanuˈwɛːba]/[ˌvɪːljanuˈwɛːva]. Furthermore, in Ilokano ll represents a geminate alveolar lateral approximant /lː/, like in Italian. In Albanian, L stands for the sound /l/, while Ll is pronounced as the velarized sound /ɫ/. In Icelandic, the "ll" represents either the sound combination [tɬ] (similar to a voiceless alveolar lateral affricate) or [tl], depending on the context. It occurs in the words "fell" (fell, small mountain), "fjall" (mountain), and "jökull" (glacier, ice cap), and consequently in the names of many geographical features, including Eyjafjallajökull. In the Gwoyeu Romatzyh romanization of Mandarin Chinese, final -ll indicates a falling tone on a syllable ending in /ɻ/, which is otherwise spelled -l.
In Central Alaskan Yup'ik and the Greenlandic language, ll stands for /ɬː/, and in Haida (Bringhurst orthography) it is glottalized /ˀl/. ^ Example of a book using the "ll" ligature. Retrieved 20 September 2014. ^ Everson, Michael & al. "Proposal to add medievalist characters to the UCS Archived 2011-07-16 at the Wayback Machine". 30 Jan 2006. Accessed 29 January 2013. ^ Real Academia Española y Asociación de Academias de la Lengua Española, Ortografía de la llengua española (2010), tapa rústica, primera edición impresa en México, Editorial Planeta Mexicana, S.A. de C.V., bajo el sello editorial ESPASA M.R., México D.F., marzo de 2011, páginas 64 y 65. ^ X Congreso (Madrid, 1994), official website. ^ "Language Log". Retrieved 20 September 2014.